I thought I'd share this simple recipe which I made for my lunch yesterday. 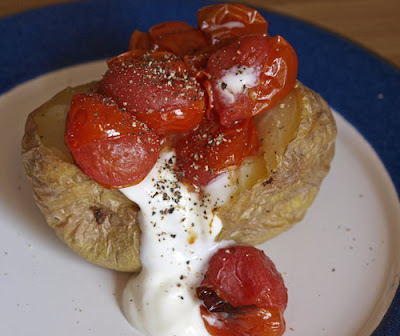 It's a simple baked potato (done in the microwave but finished off in the oven for crispy skin)topped first with a dessertspoon of low fat greek yogurt and then baby plum tomatoes which I roasted in the oven while the potato finished off. They were roasted with just a couple of sprays of olive oil spray. A few grinds of black pepper and lunch was ready. It was blindingly good for something so simple. As this is another use for left over yogurt I'm entering it for Kate's No Waste Food Challenge. 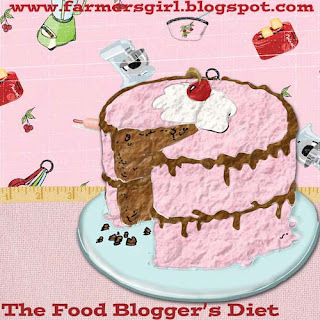 I'm also featuring my Food Blogger's Diet badge for the first time. This isn't a diet and it isn't challenge, it's just me cooking healthy, lower fat, lower calorie food. lol janice...so which bit of the cake does the dieting food blogger get, the small piece you've cut out or the larger portion that remains???? None at all until a few pounds are lost! Note the tape measure. Of course I've just been invited to an afternoon tea to celebrate my friends birthday, so will have to have some cake and cut back elsewhere! Very nice! My diet started too this week. I was doing really well until we were in town last night and people suggested pizza! I feel with age finally against me I am finding it extra hard to diet this time round! That is JUST my kind of meal Janice, and I LOVE your new badge too!